**Fodder beet supplement will run out on Monday and then cows will be supplemented with baleage. Combine the once a day staph cows with the penos this week (Tuesday) and milk all of them twice a day. To minimise the spread of staph between cows, the herd will be milked last and fill only one milking platform. Excess cows such as kickers and miss drafts that were in the colostrum mob will be sent back out to their own farmlets to prevent there being more than one rotation on the milking platform. A new methodology has been established for measuring pasture this week. The weekly farm drive will be undertaken with the C-Dax and the top x7 paddocks on the wedge from each farmlet will then be re-measured with the platemeter. From there the x7 paddocks will be visually assessed and grazed in an order the farm team deem suitable based on actual appearance and practicality. Measuring 2nd year pasture has proven notoriously difficult with the C-Dax due to the pasture having height but lacking density. With the lifted fodder beet nearly finished (this Monday), cows will then begin supplementation with baleage. Seek advice on the purple tinge appearing on pastures across all farmlets, note all paddocks with purpling at the farm drive next week and assess against the soil P status. Std FB cows were used this week to clean up random, ungrazed bulbs in the FB cropping paddocks. Unfortunately, even with being left on the paddock for 1- 1.5 hours they were not very interested in eating them. This will poise an issue later in the season when bolters begin to appear. X52 bales were made on the support block last week. The cattle yards were in action this week with R2 bloods, weights, girths, lengths and heights being taken. The R2’s also received their first PG jab later in the week which marks the beginning of mating for the Hub. 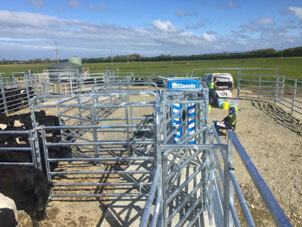 The first lot of x34 weaned calves were trucked to the support block this week. Weaning weights are decided based off breeding composition and categorised into their corresponding 80kg, 85kg and 90kg weaning weight target groups. They will continue to receive meal and grass at the support block, with meal slowly being reduced after 10 days. Recently grass in some paddocks has established a purple tinge. This brings concerns around quality; the more severe paddocks will be identified and sampled. There were two LI kale deaths this week. One was due to bulling on the yard, resulting in her going down and suffering from partial paralysis; the other due to metabolics. A proportion of each herd have been noted to have dirty tails and rough coats and many are the low BCS cow. The vets will be contacted to discuss options to determine whether there is an underlying internal parasite issue. While internal parasites are generally not an issue with mature cows we need to eliminate this as a cause. Metrichecking will be undertaken on the 29th Oct, and non-cyclers will be identified and receive a CIDR. Criteria for CIDR’s is if the animal has not cycled within 42 days post calving. All non-cyclers (irrespective of calving date) will be recorded at planned start of mating. The farm and research team are working through a process map for Feed Allocation using FarmTune guidance. This has involved mapping the current state, then the OFI’s (opportunity for improvement) and now we are looking at refining the process map with improvements and with check points added. Quite a demanding process involving both teams in a complex system. We meet in a fortnight to finish and will share the before and after maps. The farm team have been attending various off-farm courses on feed management and cow reproduction. Pre-mating measurements were undertaken on the R1’s this week with the assistance of 3 technicians from Lincoln. The tech team are working through all the data that has been collected over the last 3 months and updating all the files. Nicole and Caitlin are looking forward to a more manageable research calendar for a few months. One of our Hamilton based technicians will be onsite next week to give the techs a break.